After filing patents by Indian for FTR 1200 few months ago.All eyes were focused on this bike.Now take it from me when I say that the FTR 1200 is going to be a legend of its own. The bike seems to be from another planet completely. So the question I am sure every one of us is asking is how different it is that we had to change the vision of what we had of American bike? This bike is none like the stereotype images that is been seen around of Peter Honda and Dennis Hopper in Easy Rider enjoying their cruise or that of a custom white boy living the life or an old bearded guy with ponytail in the wind. This bike will defy all of that. This is due to the simple fact that this American bike has been built with every different type of riders perspective in mind and knowing fully what they expect of an FTR. Now another good news is it will come in two variants and four curated collections. Although there may be very little that is known about it in Europe, the flat track is one of those bikes that you cannot dissociate from American motorcycle culture. The races there are extremely popular and pilots are stars on their national territory. Obviously, all this seems to us well far, but I will perhaps develop greater interest in it after driving the new Indian FTR 1200. This is simply because everything seems to have been perfectly put together so that the feeling that is developed from those handlebars is sensational: a powerful engine (120 hp and 115 Nm), a compact size and a quality frame! So yes, this United states motorcycle gem is a blend of flat tracker and scrambler; and it is also considered by many to be a roadster which is quite sporty and at the same time very impressive. A bike that one could never imagine it would be built is going to hit the road in 2019! Harley did something similar upon conceiving the XR 1200 X . In this situation, what Harley came up with is somewhat a trial version because the bike created by Indian is a literally a masterpiece. Well, it is true that they must have given the same speech as Harley but with a much more successful output. The idea is to transpose the spirit of the FTR 750, victorious machine on the championship American AMA Flat Track, into a perfectly flawless road bike. The Engineers who conceived and built Springfield would have been content to change the fork, handlebars, footrests and put a beautiful decoration and claim that was the new FTR but that was not the case. The FTR 1200 is a true novelty, a model which has nothing similar to the others. The engine is new. The rest of the significant changes which were made will be discussed subsequently. . The twin has really grown in size. By lengthening the piston stroke from 99 to 102 mm, engine manufacturers have immensely increased the to 1203 cm3 . A good dose of magnesium was added so they could bear the weight without any worries. An optimized admission via a airbox above the engine, a high compression ratio which has been increased up to 12.5: 1, high flow heads, double throttle bodies and crankshaft with inertia reduced, thereby changing the dimension of this berlingot. With an output power of 120 horsepower, enhanced in their momentum by a peak of torque which measures 11.7 mkg, the FTR 1200 is out to conquer. It’s not yet close to what the Italian or Japanese giants may produce but one thing that’s for sure is that this bike incorporate a real new approach to harnessing power. This time, we definitely have something to write home about given that this this time around, there is some part of the bike that can be welded but that notwithstanding, the chassis has to be ad-hoc. It is at this level that Indian really distinguished themselves from all the other producers. It was out of the question to produce something which was no different from the custom bikes produced. So they decided to do away with the usual hack and rather put their thinking caps on and as a result, the FTR 1200 finally gets an original tubular lattice frame all made in steel. It has a subtle swing arm and a purified suspension similar to those on the RDF 750 of race. Impressive! The reservoir is positioned immediately under the saddle in order to lower the center of gravity. In front we have an inverted 43 mm fork complete with radial 4-piston brembo discs. The FTR can be used for sports but not that selective. With a good wheelbase of 1524 mm (meanwhile a Ducati 1200 Monster is at 1485 mm), a flush angle of 26.3 ° and a dry weight of 225 kilograms, the FTR doesn’t really have the looks of a sulfurous bike … but already a very sassy for a American bike. It is meant to handle any Play, an amount of gas and getting onto the track whenever you want, so don’t be worried. Hold on! FTR is not a pure breed roadster such as the regular ones. Its tyres are somewhat different from those of others bikes in the same category. At the front we have a wheels of 120/70 – 19 and a 150/80 – 18 at the back. Coupled to that are suspensions of 150 mm. The bike is so well-equipped that ridding it feels like riding in the comfort of a trailer. This is probably quite confusing but it should be noted that this bike is an adaptation of a Flat-Track bike, as such, it is meant to be used on the slopes. It is no other company but Dunlop that provides Indian with DT3-R. The material from which this is made is meant to provide a better adherence to the road and the design was inspired by the racing world. Let’s get back to the basics of what is noticed on this bike at first glance. This Indian challenges every other bike with its style. It cannot go unnoticed and the only regret in design is manifested by the imposition of a exhaust huge .Either way, something about its style permits it to stand out ;The left side of the machine gives it a much more of a streamlined look . At the level of the cockpit, FTR 1200 has very little to showcase for; aluminum handlebars, made by ProTaper, circular tachymeter scale with a digital screen, and that’s all. She is much more seductive side luminaire. The manner in which the taillight is presented gives a beautiful identity to this bike. The optical block at the front is irrefutably the best ever. With a Round of cover, it has so many LED’s with a visual signature of its own. In order to make everything great and not to forget a way to add a little bit of décor to your riding, there is a USB port in front that lets you connect your GPS or recharge your smartphone. There is a speed regulator which you can use to switch to cruising if you rather prefer to hit the road rather than following the usual trend. The FTR 1200 will also be available in a 70 Kw version that will be able be compatible users of the A2 license. So that S declination with better suspensions, more vibrant colors, a Ride Command instrumentation adapted three engine maps, a stability control, traction control and anti-wheelie. 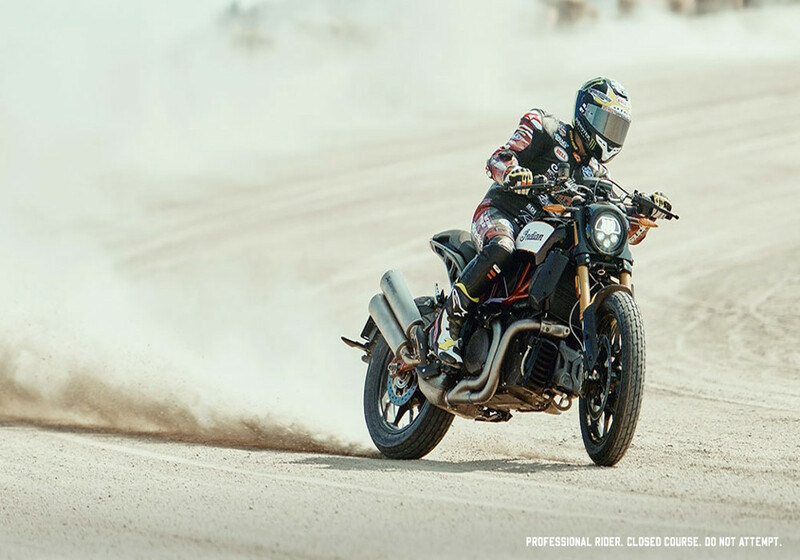 Indian FTR 1200 & FTR 1200 S 2019: Long live the sport! We can never thank Gerard Holtz enough for having, done this masterpiece which till date that remains a eternal source of inspiration. With a wheelbase of (1524 mm! ), which should at least ensure stability during the long drifts , an evenly spaced arrangement (caster angle of 26.3 ° and 130 mm hunting) and weighing a tad high (225 kilos dry for the FTR 1200, 226 for the 1200 S), fun and driving sensations should be expected from such a gem. The fineness of the machine and the seat 805 mm should make it accessible to the greatest number, while the tank has been placed under the saddle, helps in balancing the mass and the lowering the center of gravity. Dunlop has developed a new tire, the DT3-R, which is quite similar and very close to the DT3 which officiates in flat-track, with a 19- inch wheel on the front and another which is 18 at the back. The Indian FTR 1200 and FTR 1200 S will be available during the first half of 2019, around April / May. The price is set at € 14,690 for the FTR 1200, € 15,990 for the FTR 1200 S.